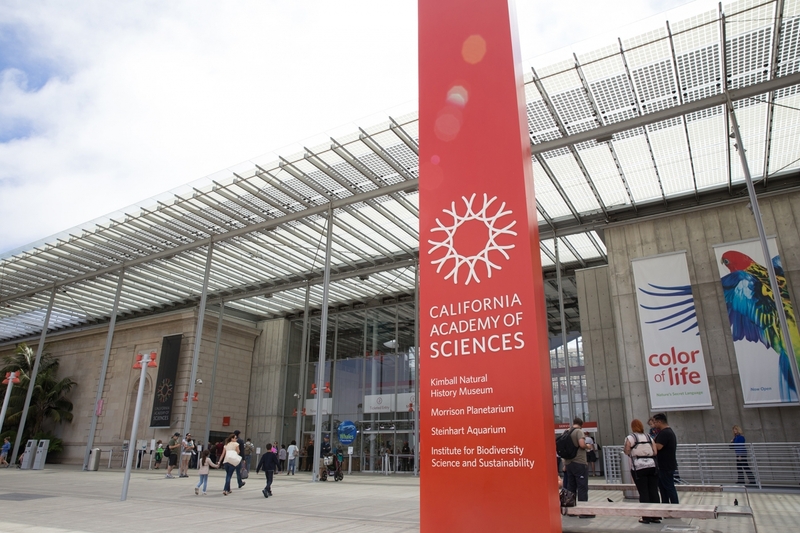 Established in 1853, the California Academy of Sciences houses one of the world’s premier natural history museums. The institution has amassed a collection of millions of scientific specimens over the years, including carefully preserved plants, insects, fish, and mammals. After an earthquake damaged its historic facility in 1989, Academy officials began planning and fundraising for a new building to securely store the collections and educate the public. 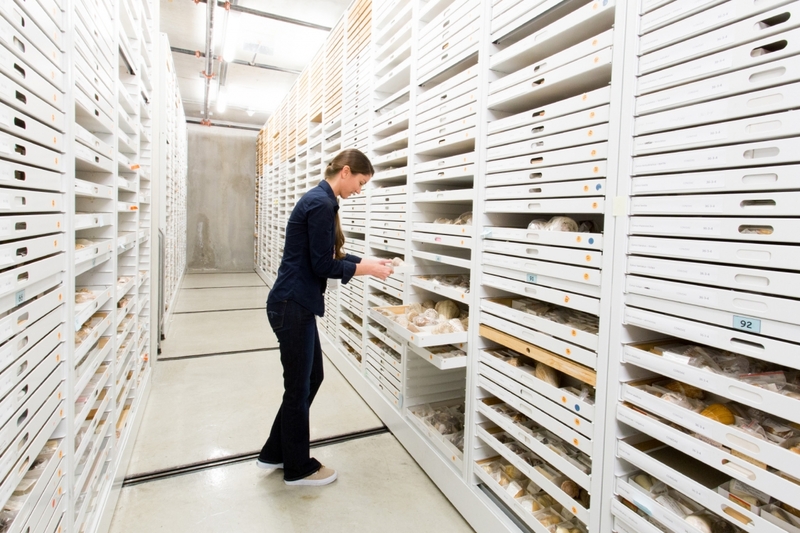 The Cal Academy’s collections required storage that would meet several requirements: it had to protect the specimens; it had to provide convenient access to researchers; and the storage had to be durable, maintaining its integrity over decades of repeated use. Spacesaver and Delta Designs were ultimately selected to provide custom storage solutions for the museum’s extensive collections, and the Cal Academy opened the doors to its new $488 million, 400,000 square-foot building in 2008. The collections storage area is not open to the general public due to many of the specimens’ rare and delicate nature, but Academy scientists and hundreds of authorized visitors use the collections for research and study each year. Prospective visitors must have a well-established professional reason for wanting to gain access to the collections storage area but they need not be scientists — artists, historians, and others can request access from the appropriate collection manager. Because of the vast size of the museum’s collections, and because many of the scientific specimens have stringent storage and security requirements, a small fraction of the collections is on public display at any given time. With the construction of its new facility, Cal Academy staff wanted to give museum visitors a glimpse into the behind-the-scenes research conducted by Academy scientists and visiting scholars in the collections storage areas. They devised an innovative solution that integrates the collections area with public display space. 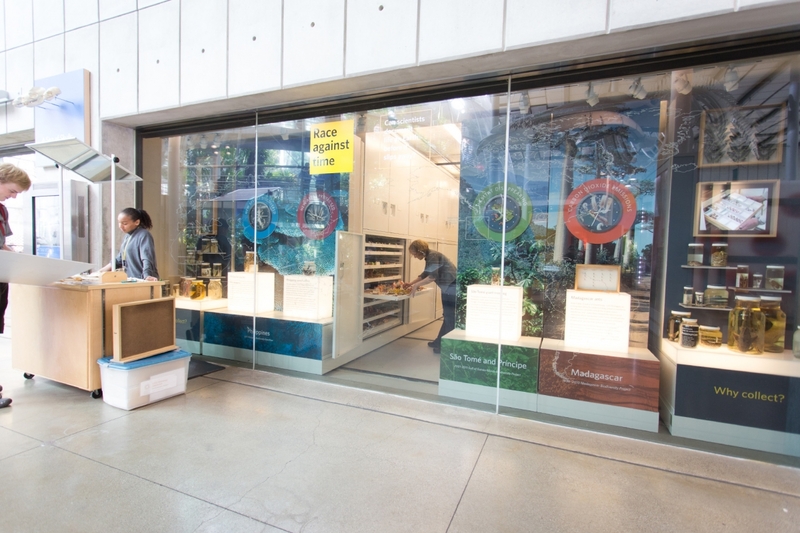 The exhibit provides researchers with convenient access to a climate-controlled portion of the storage area while also informing the public about the importance of specimen collection and preservation. The Cal Academy houses approximately two million botanical specimens. Most of these specimens were dried, pressed, mounted on acid-free paper, labeled, and stored in archival-quality folders. The collection is stored in Delta Designs cabinets mounted on Spacesaver’s half-height mobile panels with single-spoke controls. The cabinets have locking handles, internal partitions to house folders of mounted specimens, and pull-out shelves to facilitate note-taking and study. 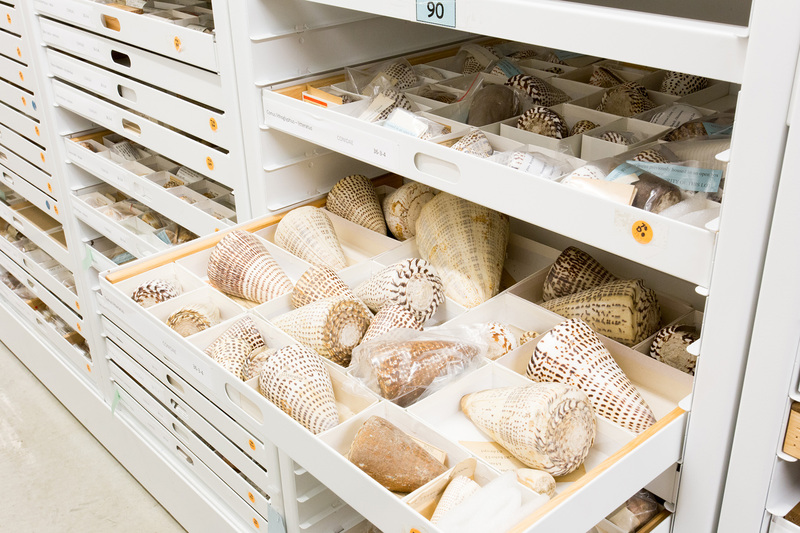 Cabinets and shelving on rails provide compact storage for a wide variety of specimens in the Academy’s invertebrate collection, from tiny shells to large sea sponges. When specimen preservation requires an absence of dust and moisture, cabinet doors are fitted with gaskets to create an airtight seal. As with all collections storage throughout the museum, an enduring paint finish was of utmost importance on all shelving, drawers, and cabinetry; staff required paint that would not scuff or chip despite decades of frequent use. 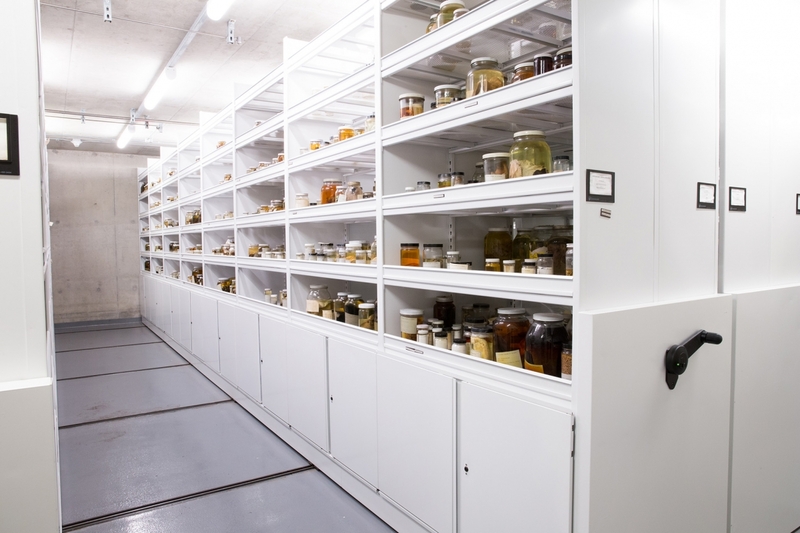 Spacesaver engineers worked with Cal Academy staff to design compact mobile storage solutions to accommodate the special challenges posed by glass jars and large steel trunks containing sharks, reptiles, birds, and other specimens preserved in liquid. Special care must be taken when storing such specimens, particularly in seismically active areas like San Francisco. The shelves in these four-post shelving units are perforated to allow liquid from accidental spills to flow through the shelving and onto the floor, where the liquid is drained out of the room. Bin fronts, or “earthquake bars,” finish the front edges of the open upper shelves to prevent spillage or breakage in the event of an earthquake, and partial doors enclose lower shelves. The large stainless steel trunks were acquired from a third party and they are housed on wide-span shelving mounted on carriages with half-height panels and mechanical-assist controls. The Academy Library was founded in 1853, simultaneously with the Academy itself. Devoted to natural history and the natural sciences, the library’s collections include a variety of media including maps, photographs, journals, and books. 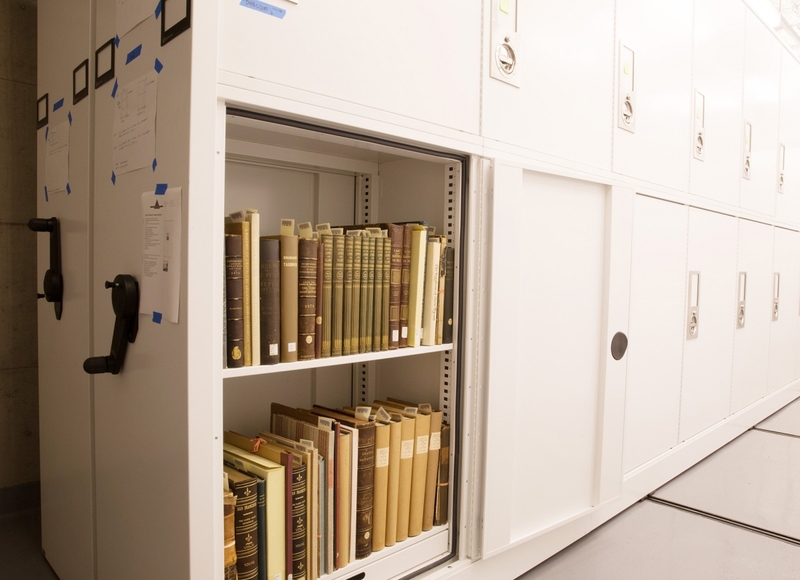 The museum’s rare books collection is stored in Delta Designs cabinets mounted on Spacesaver carriages and rails. The cabinets feature adjustable shelving, locking doors, and airtight gasket seals. Systems & Space provides ongoing service for this project. As the museum’s storage needs change over time, Spacesaver remains a committed partner in the preservation of the Academy’s renowned and ever-growing collection. Learn more about our museum storage solutions by visiting our museum market page, or by downloading our Museum Storage Guidebook.